Becoming a representative from the whole world for a popular idol group, B.A.P, is not an easy task. Though, because of BABYs enthusiasm and love for their idol, nothing will be a problem. B.A.P Yes Sir! or BYS is a fansite or fanbase specifically for BABYs who want to know B.A.P’s latest updates and B.A.P’s journey from the start of their career till this day. This site that has been operating since 30th January 2012, has been recognized by B.A.Ps’ label, TS Entertainment as a legitimate fansite which spreads certified updates. News contents which are uploaded to the site are mostly taken from B.A.P’s official website (www.tsenter.co.kr/bapwarrior) and TS Entertainment’s official Twitter account (@TS_Enter). Until now, BYS is handled by 80 staff members from four continents around the world. This site is lead by Isa from Canada as the founder and general manager, with their mission to spread B.A.P’s name to introduce B.A.P and their music to the whole world. This globally run site can be browsed in eighteen languages which includes Russian, Thai, German and Malay. Four BABYs from Malaysia who were officially chosen by BYS as Malay translators and BABY activity movers here are Ben, Mariana, Zulaikha and Kay. 1) Donation of 140USD to World Wide Hearing in celebration of Himchan’s birthday. 3) Donation of 200USD cash to UNICEF ‪#‎ChildrenOfSyria‬ in celebration of Yongguk’s birthday. 5) Donation of rice to the poor in South Korea. 6) Donation of 70USD to Brain Tumor Organization in celebration of Jongup’s birthday. 7) Donation to UNHCR in celebration of Youngjae’s birthday. 8) Sent congratulatory hampers [rice wreath] in celebration of B.A.P’s first anniversary. 9) Donation of 75USD to Stop Hunger Now charity organization in celebration of Daehyun’s birthday. BYS provides a special forum for BABYs who wish to voice out their opinions about BYS’ journey and to contact other fans around the world. With this forum, all planned activities can be done perfectly and easily. 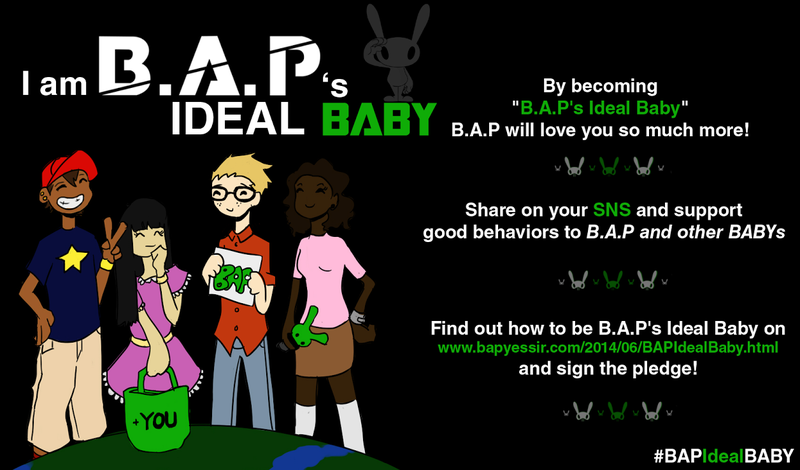 This forum has aims to strengthen friendship between them all [BABYs]. Furthermore, in this forum, BABY representatives from each country will announce dates, places and times for Weekly Fanmeetings which will be held in their respective countries. 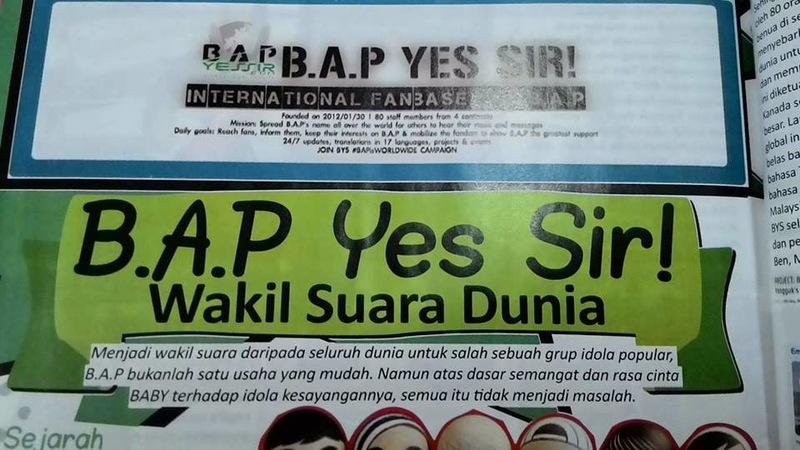 Get exclusive reveal about B.A.P YES SIR! 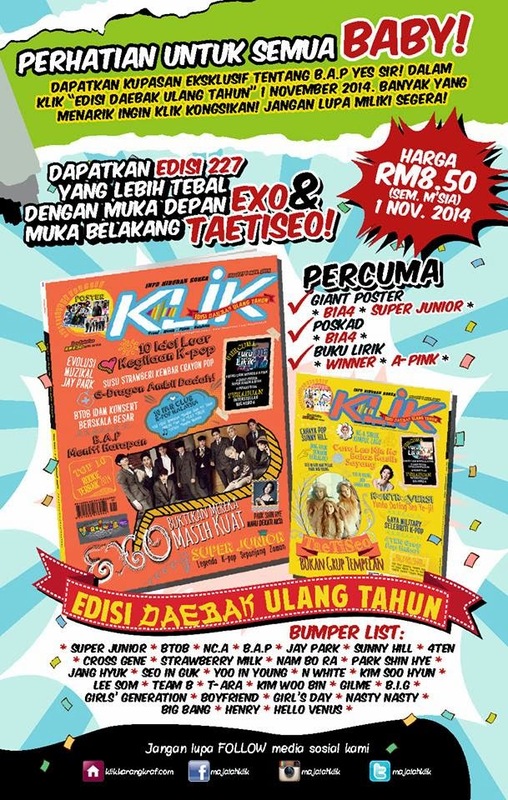 In Klik "Daebak anniversary edition"